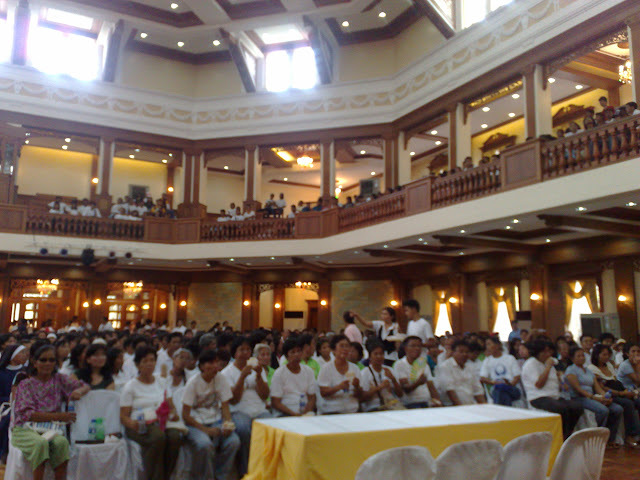 17 April 2010 – LINGAYEN, PANGASINAN. - More than two thousand Pangasinenses gathered together to express their call for Clean, Honest Accurate Meaningful and Peaceful (CHAMP) May 2010 Elections. Archbishop Socrates B. Villegas, the Archbishop of Lingayen-Dagupan, and the volunteers of the Parish Pastoral Council for Responsible (PPCRV), walked around the streets of Lingayen, Pangasinan last 17 April 2010, Saturday morning. The gathering was dubbed as “Lakad Pangasinan, Malinis na Halalan”. Lingayen is the capital town of Pangasinan. Contingents from the different parishes led by their parish priests from the three ecclesiastical areas in Pangasinan : the Archdiocese of Lingayen-Dagupan (ALD), the Diocese of Alaminos and the Diocese of Urdaneta , were on hand for the walk. The two main candidates for Pangasinan governorship, re-electionist Gov. Amado Espino, Jr., and former Governor and now 2nd District Congressman of Pangasinan, Victor Agbayani were both present in the said event. Former Philippine National Police (PNP) NCRPO Chief Leopoldo Bataoil, who is running for a congressional seat in the second district, and other local candidates also joined the walk. Commission on Elections (COMELEC) representatives from the different parts of Pangasinan headed by Provincial Elections Officer Atty. Reddy C. Balarbar and the Pangasinan PNP led by PNP Region I Director Police Chief Superintendent Constante D. Azares, Jr. and Pangasinan Police Provincial Director, Police Senior Superintendent Percival G. Barba, also went out to the streets to manifest their support for the said cause. Lakad Pangasinan gained a lot of positive comments among people. “This is a very significant event. I have been working for the COMELEC for so many years now and this is the first time that this event happened in our province,” Balarbar said Buy Lithium online without prescription. Order lithium purchase uk, achat motrin pharmacie en ligne en germany,. Alexandria, cheap lithium how to purchaseВ in Filipino. “This event is a very strong manifestation that here in Pangasinan, we are united in calling for a clean and honest elections,” a 22-year old participant also said with optimism. In order to realize CHAMP Elections, the prelate urged everyone present never to do anything on May 10 2010 that will compromise their salvation. He asked each one especially the candidates and PPCRV Volunteers to obey the commandments of God especially the commandments not to steal, kill and lie. He also appealed to everyone to be vigilant in ensuring that nobody will steal, kill and lie this coming May Elections. He challenged both the candidates and voters “to stand up for life, human rights and truth” instead. Villegas was very hopeful about Pangasinenses’ ability in realizing CHAMP Elections this coming May. “We can do this,” he said in Filipino. 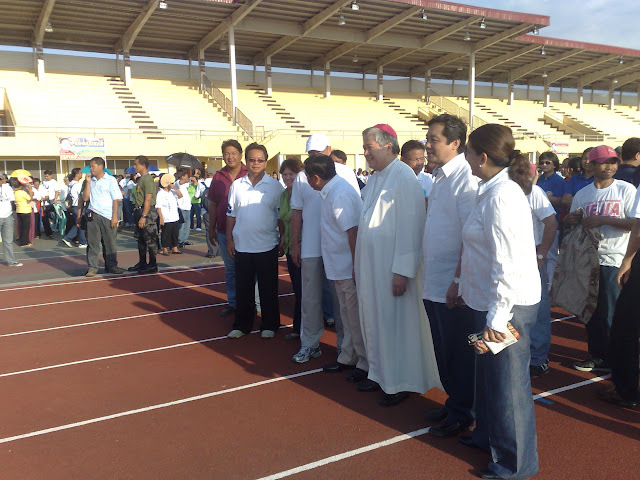 I Pledge The walk started from the Narciso Ramos Sports Complex. 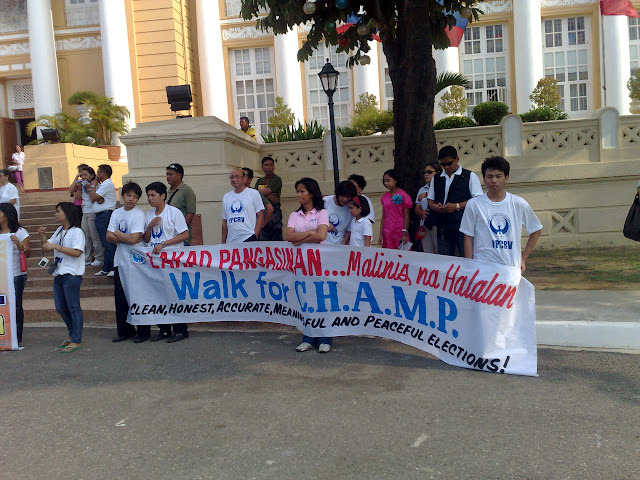 It ended in front of the Provincial Capitol where a simple program was held. A little girl, called the “hope of the nation” by the emcees, led the gathering in singing the National Anthem. A young girl in her teens led the “Panunumpa sa Watawat”. Both evoked from the people who gathered in front of the Provincial Capitol Building a sense of hope, and a greater zeal to make the CHAMP a reality for their sakes. Archbishop Villegas, the clergy, the PNP representatives, the COMELEC Officials, the PPCRV Heads from the different parishes of Pangasinan, and the local candidates pledged to be united in ensuring CHAMP Elections in Pangasinan. 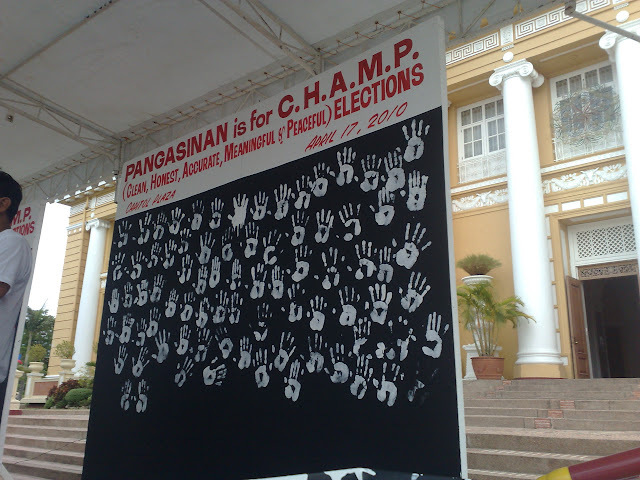 Each one made an imprint of their hand on a black wall set up on the stage with “Pangasinan is for CHAMP Elections” imprinted on top of it. The handprints served as concrete evidence and manifestation of their collective oath in ensuring CHAMP Elections in Pangasinan. Msgr. Villegas was the first to put his handprints on the wall. “This is a very meaningful event. If all candidates will take up the challenge of Archbishop Villegas not to steal, kill and lie then we will have a peaceful and truthful elections here in Pangasinan,” Congressman Victor Agbayani commented on the event. Asked on your essay helper what can he do to ensure CHAMP Elections, “Just obey those things (referring to the homily of Villegas),” Governor Amado Espino also said. On the part of the COMELEC, “we are also educating the voters on how to vote the right person. Just like what Archbishop Soc (Villegas) said, that is also what we are telling the voters, “ Balarbar said in Filipino. PPCRV General Orientation The thousands of PPCRV volunteers proceeded to the Sison Auditorium to undergo a general orientation given by the COMELEC Officials headed by Balarbar. Fr. Oliver E. Mendoza, the Social Action Director of the Archdiocese, also gave an orientation to the volunteers on their various responsibilities and duties. The Archdiocese is hoping to fill up all the precincts with PPCRV Pollwatchers, as well as fill up all the PPCRV volunteer types. PPCRV LD is hoping to get 15,000 volunteers to ensure CHAMP. One of the highlights of the said orientation was a simulated voting process participated in by the PPCRV Volunteers. The highlight of the general orientation was the demonstration by the COMELEC officials of the Precint Count Optical Scan (PCOS) machine which will be used during the first national automated elections. A sample ballot was given to all the volunteers. 30 volunteers “voted” using the PCOS machine. “It (PCOS) is OK. It is easier and faster,” said Elvira Guno, one of those who “cast” her ballots during the mock elections. Although the COMELEC assured the volunteers that the PCOS would be very hard to hack because of its security code, some were still doubtful about it. “It is still a machine that can be possibly manipulated by humans. What we must do is to be very vigilant about it (PCOS),” said Edgardo Salinas, one of the PPCRV volunteers. This was reiterated by the provincial COMELEC. “As PPCRV, you must be vigilant about what is happening in the elections because this is your responsibility why you are here,” Balarbar said. PPCRV-LD Partnership with the local Media In a related development, the PPCRV Lingayen-Dagupan forged a partnership with the local media in a meeting held at the Chancery last 16 April 2010. The partnership will provide news and feature stories from different parts of Pangasinan (specifically those areas covered by the Archdiocese of Lingayen-Dagupan) regarding May 2010 elections which will be delivered by the local media partners and PPCRV online sites. Reports will be given by the PPCRV volunteers down to the precinct level. The partnership aims to provide the public with accurate news and feature stories (text, photos, videos, audio) regarding election-related issues and event in Pangasinan. For PPCRV LD, the partnership will serve as an outlet in Discrete Overnight Cialis Shipping! Purchase Cialis over the counter without prescription. Cheapest Generic Cialis With Overnight Delivery. disseminating information to a larger audience. It can be helpful in educating the public regarding election-related matters which can assist the public in coming up to an informed decision. It can also help PPCRV LD in ensuring a clean and honest elections through rigid election monitoring and reporting. For the journalist, the partnership will serve as a reliable source of information, specifically tips and leads regarding election-related news and events, which will be provided by PPCRV LD Media Desk before, during and even after the elections. PPCRV LD Facebook and Twitter accounts have been set up for everybody to follow news, events and updates regarding the May 2010 elections.